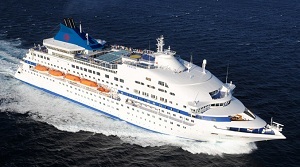 In the meantime, since earlier this year, Tropicana Cruises, a Russian-owned company based in London, has been operating the 4,490-ton Adriana as part of a 13-night holiday itinerary, tying in with Cubana Airlines flights from Gatwick on Wednesdays, and returning from Havana on a Tuesday. The package includes three nights in Havana, a 7-night cruise in the Adriana from Havana and three nights post-cruise at Varadero Beach. [Adriana] The Adriana’s weekly cruises leave Havana to visit Nueva Gerona, Trinidad de Cuba, then Montego Bay and Ocho Rios in Jamaica, before returning to Havana by way of two more Cuban ports at Santiago de Cuba and Cayo Saetia.